If you’re ready for Kitesurfing Lessons, KITE ECUADOR puts at your disposal the best team of instructors, the best material, and the best infrastructure so you can learn and enjoy a unique sport. Located 10 minutes walking downwind from a small tourist fishing village, Santa Marianita, Manta, Ecuador. It has a ‘point Break ‘ that provides excellent waves, the ideal spot to practice kitesurfing, SUP or surfing. It is well known by kitesurfers and kiteboarders for its ideal climatic conditions. With an extension of 3 km of beach, Santa Marianita is an enchanted place. The wind blows most of the year, from April to January to an average of 12-24 knots. If you have never had any kitesurfing lessons, a great place to start is with our 2-hour fun course. This will give you the basics of controlling the kite, and teach you about the gear involved with Kitesurfing. You will fly a trainer kite, and learn how to set up a 4 line inflatable kite. You’ll learn about wind direction and wind speed, and some of the technical aspects of kitesurfing, like the power zone and wind direction. Depending on your control of the kite, we may get in the water and start body dragging. Next, you can transfer to our 4-hour adventure. You may upgrade at any time to the longer courses if you’re having fun and enjoying your lessons. During the 4-hour adventure course, you will get to experience the real power of the kite in the water! You’ll learn how to generate power, body drag upwind, and water relaunch the kite. 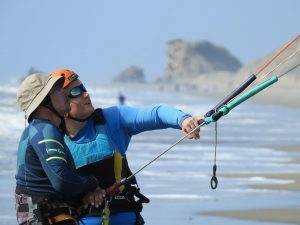 Depending on your control of the kite, you may learn how to control the kite with one hand, and learn about self-rescue. If you want to get up on the board, then you can move on to our 8 to 10 hour Freeride Independent Course. This course takes place over 3 to 4 days and will teach you all of the steps needed to become an independent kiteboarder. After this course, you will have the knowledge and tools required for a basic water start, to get up and start riding on the board. You’ll learn about surf, tides, and to select the proper gear for the wind conditions. You may learn how to water start and ride a short distance in both directions on the board. For the most complete course, our 12 to 14 hour Freeride Independent is the best choice. 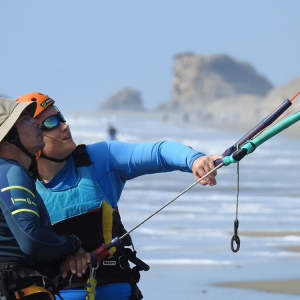 Most students who complete this course become independent kiteboarders with the skills necessary to set up their kite, lines, harness, and board and go out kiteboarding without the help of an instructor. 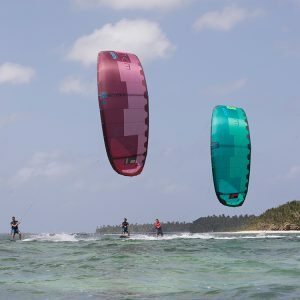 Upon completion of this course, you will be IKO Certified level “K” to level “L” with an IKO Member card, and you can rent kitesurfing gear anywhere in the world. You will learn to have precise kite control in all situations, and you’ll be able to control the kite upwind or downwind. 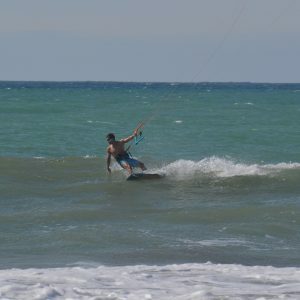 You’ll be able to control your speed in both directions, and you’ll learn the “right way” rules of kitesurfing. By the end of this course, you’ll be a self-sufficient kitesurfer. We offer lessons for all levels. If you have started kiteboarding in a different location, we can give you a refresher course and send you out with a supervisor. If you’re already certified, we offer rentals. We have brand new 2018 gear from North Kiteboarding and ION. We have kites from 9 to 18M so we have you covered no matter what the wind conditions are! Our equipment is top of the line. 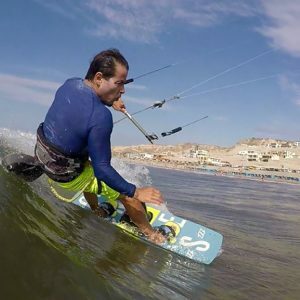 We are the only North Kiteboarding distributor in Ecuador, so if you’re looking to purchase new gear, we guarantee the best prices in the country. If you are already a kitesurfer, and you have mastered riding upwind and even landing a few small jumps, you should try the latest craze in Kitesurfing — foilboarding! A foilboard, AKA a hydrofoil board, is very similar to a regular kiteboard, but it has a hydrofoil that extends below the board down into the water. This design allows the board to rise above the water while the foil stays in the water. You can fly above the water at different speeds. Because the amount of drag is much less than with a regular kiteboard, you can use a much smaller kite, and you’ll be able to kite in lower wind conditions! What are you waiting for? Message us today to schedule your Ecuador Kitesurfing adventure! 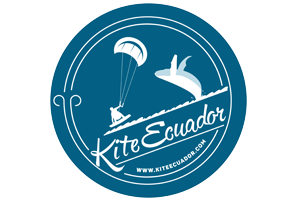 The Kite Ecuador team is ready to turn you into a kiteboarding addict. We look forward to hearing from you!